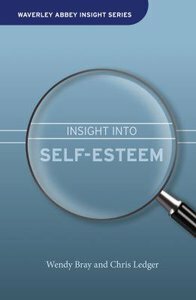 Based on its now well-established Waverley Abbey Insight Days, CWR are pleased to present Insight into Self-Esteem, one of next 2 books in this new series. Insight into Self Esteem is a book based on a seminar given by Christine Ledger at Waverley Abbey House. It has been written and developed by Wendy Bray and is an honest and personal approach to the problems of low self-esteem. The term self-esteem describes how we judge ourselves, and the value we attach to the kind of people we are. It is strongly related to the way we think a "significant other" person in our lives sees us for a Christian, the "significant other" person who plays a major role in our self-evaluation is God, for it's in Him only, that we will find our sense of true value and worth. Therefore cultivating a healthy self-esteem grows from a deepening relationship with God, as we come to know Him more, in and through Jesus Christ. The insights shared here incorporate both a foundation of established research and a wealth of practical experience. - Publisher The term self-esteem is a measure of how we judge ourselves. Cultivating a healthy self-esteem grows from a deepening relationship with God as we come to know Him more through Jesus Christ. About "Insight Into Low Self Esteem (Waverley Abbey Insight Series)"
The term self-esteem is a measure of how we judge ourselves. Cultivating a healthy self-esteem grows from a deepening relationship with God as we come to know Him more through Jesus Christ. Wendy Bray is a freelance writer and journalist who has written and contributed to several books. She writes features for a wide range of publications. Her first book #145;In the Palm of God's Hand' - an honest but humorous diary account of living with cancer - won the biography prize in the Christian Book Awards 2002.